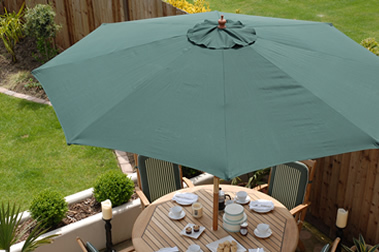 2.75M and 3.5M x 2.6M parasol covers are available in all Colonial and Bespoke designs. Supplied in printed and zipped hanger bags to allow for easy displaying. The covers have zipped leather end pouches and are machine washable 40°C. Suitable for commercial or domestic use. Zipped leather end pouches and washable cover. Protective zipped leather end caps on all our parasol covers.